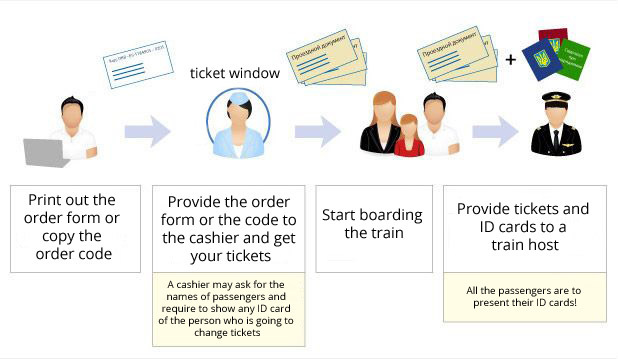 What does an electronic railway ticket look like? 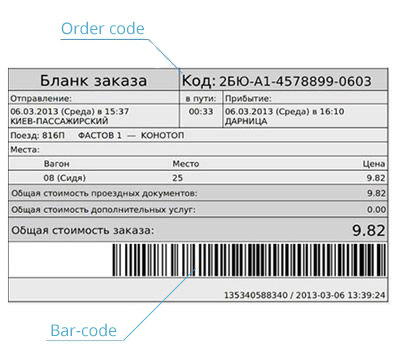 The main features of the railway ticket are its unique number and code. You should either write out the ticket code and then contact a railway station ticket office, in order a cashier prints out the ticket, or print the ticket yourself. These E-tickets are available for most Ukraine trains. You are able to go boarding as with a printed out ticket by yourself, as well as with a printed out ticket by a railway station ticket office. You are able to go boarding having a printed out E-ticket (earlier on, this was available only for the “Intercity” and “Intercity+” trains). If you are not able to print the electronic train ticket out by yourself, or you need a regular ticket, please contact in advance a railway station ticket office in order a cashier prints out the ticket (you should bring with you a ticket code). If you plan to travel and buy a ticket on Ukrainian Railways — it could appear not so easy. Timetables of trains are constantly changing, Ukrzaliznytsia tickets are sold faster than people manage to get to the ticket office. There may also be other unforeseen circumstances. On this page, anyone can find train tickets without worrying about their availability or the quality of the service. All you need is to specify the program where you plan to get on the train and on which station you are going to leave the train. In addition, you should specify the exact date on which the trip is planned, along with personal details of all passengers. After that, click the "Find" button. Our express-search form works within the latest databases, which contain actual information about existing routes, traffic of trains, availability of convenient compartments, travel costs, tickets, etc. This allows you to cope with this task in the shortest time, with little effort and minimal time. If to take into account a psychological comfort, searching for railway tickets, as well as booking and purchasing, is indeed more pleasant when performed online. The positive side of the self-service terminal on the Internet is the exceptional speed of the automatic service. Using the online search, you can always be informed about available tickets for any route, as for one direction, as well as in both travel directions. An electronic train ticket can always be exchanged at Ukrzaliznytsia ticket offices according to the rules. After completing railway ticket booking online or purchasing a ticket, our agency will send a unique code to the email specified by the customer. You will need to download this code to your smartphone or tablet. When boarding the train, please allow the special mobile terminal to read the code — this system already operates on the new “Intercity” and “Intercity +” trains for all permanent trains in Ukraine. It is possible to board on the most trains, having a printed out E-ticket, for example, Zaporizhia— Kyiv, Odessa — Kyiv, Simferopol — Kyiv, Donetsk — Kyiv, etc. As you can see, this way is much easier, than using the standard method of a train ticket reservation, as well as ticket purchasing at the railway station ticket office. 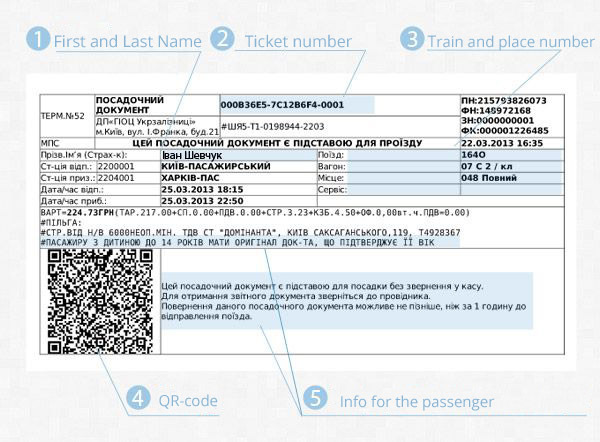 What do the electronic railway ticket and other documents look like? E-tickets are available for most Ukraine trains. It is enough to print out train tickets to be able to go onboarding. There are rare directions for which you will need to print a ticket out in the railway station ticket office (don’t forget to provide a receipt). You are able to see whether the train ticket enquiry is available in the booking system. When you’ve ordered tickets online on our website, you are able to get rid of many problems and to concentrate on other important things to do: determine the plan of work, arrange documents, calculate the budget, etc. We are ready to provide you with a complex assistance in preparing your trip. Our lawyers will work with your visas and passport preparation and solve all issues in the consulate of the country of destination. We will simplify the process of a trip organization so that you can get the most out of leisure and pleasure during your business or personal journey. Buy train tickets for Intercity: the earlier, the cheaper! The following fact is of a great importance — electronic railway tickets are bought mostly in Kyiv, many passengers prefer trips in modern, comfortable, high-speed Intercity and Intercity + trains. These trains have already been launched on the routes from Kyiv to Dnipro, Zaporizhia, Odessa, Donetsk, Kharkiv, and Lviv. There is a line that connects Donetsk — Dnipro — Kharkiv. The price in the new Intercity train set depends on the time of departure, the time of purchase and the date of travel. You can also find out the cost of a ticket to Intercity at the time of the request through the online order form. Try it once and you will definitely like it. Online train ticket booking is easy, fast and reliable. Look at how the trip looks from the inside. Those passengers, who have already used high-speed railway services on Intercity trains, know that such a trip is convenient and comfortable. According to our frequent tourists’ feedback, — sometimes it makes sense to buy railway tickets to the lounge car, as the lounge car is not crowded and you will feel free-and-easy. You are able to watch TV in the Intercity and Intercity+ trains, but actually, they usually disturb tourists more, than entertain. Do not hesitate to ask the train guide to make a sound quieter, if it disturbs you. Please note that the seats in the train cars are located in different ways. If you like to travel face-up on the move, please choose such a place. One more thing to point on. For those who travel with family, friends or company, it will be convenient to choose places facing each other with a table in the middle. The price of the Intercity train tickets is slightly higher than for common trains, but it’s worth it. If you’ve decided to go by train — choose comfort! When you travel by the Intercity train for the first time, you can be really surprised by the buttons on the doors to the train car and between the train cars — when you press them, the door opens automatically. This feature is already not new in Europe and such buttons are successfully used in trains. Wi-Fi in the modern Ukrainian trains is still an exception, unfortunately. Your computer can even catch a Wi-Fi signal, but it will not always be possible to access the network. On the other hand, there are sockets near each seat, so you can work all the way at the computer or watch your favorite movie. Railway transport is one of the most comfortable ways to get to the right place, especially when it comes to the local trains. In Ukraine, traveling by train takes the leading position in the transport sector and provides 50% of the transportation compared to other means of transport. Nowadays, when the transport sphere is extremely modernized, and the ticket booking system is simplified to the online mode, the use of railways has become even more convenient. The most popular destinations in Ukraine are the routes to the following cities: Kharkiv, Dnipro, Zaporizhia, Odessa, Kyiv, and Lviv. Ukrainian Railways have 6 routes: the Southern Railway (Kharkiv), the Donetsk Railway (Donetsk), the Odessa Railway (Odessa), the Lviv Railway (Lviv), the Dnipro Railway (Dnipro) and the South-Western Railway (Kyiv). The railway sector is almost monopolized by the state administration of Ukrzaliznytsia. Near 385 000 employees serve 1614 stations, the highest passability of passengers is noted in Kharkiv, Dnipro, Lviv, Odessa, Zaporizhia and Kyiv directions. using online train ticket booking system. Nowadays, electronic train tickets are used for all popular railway lines of Ukraine, covering in total 91 directions. Passengers can take advantage of a wide range of services, in particular, you can make a choice to travel in a women’s or men’s compartment, however, you are able to buy these tickets exclusively through the railway station ticket office. It is also possible to pay there for a tea at once. For a particular fee, paid directly in the train, you can count on a bed sheet, drinks, reading material and use of a microwave and a fridge. You can also arrange a video and audio broadcast service with a help of the train host. Ukrainian Railways carry passengers providing different levels of comfort, a ticket price varies depending on a train car class or a train class. Railway junctions nowadays are the sweet spot of passenger transportation in the ratio of price-quality and safety. Review text: The second-class train car of the “Intercity” surprised us by the climate control system. Outside – sun heat, and in the train car comfortable temperature, fresh air, but doesn’t blow. Armchairs are comfortable, there are stable pull-out tables, withstand both a laptop, and an ultrabook, a spacious passage and a vestibule, 2 clean toilets. Constantly deliver tea and coffee, in train always clean. The only one minus is that WiFi doesn’t work. If you need internet – take a 3G modem (the mobile Internet working on the most of the way). The train is on the way for 7 hours, arrives in Zaporozhye at a convenient time.